TJONG MEN TJONG, a 62 years old lymphoma patient, looked fresh and rosy and he was optimistic, calm and firm. When he knew that he was diagnosed with lymphoma, he felt at lost and helpless. In June 2014, his weight suddenly lost 5 kg so he went to see doctor in Jakarta. Though the lymph nodes of neck and groin had enlarged for three years, he did not know he had lymphoma. After taking treatments for 3 weeks, CT scan showed that there were many lymph nodes in the body. The local doctor extracted the bone marrow to take a test for further diagnosis. When waiting for the result of the test, TJONG MEN TJONG felt extremely nervous. He suddenly reminded that he saw a news about Modern Cancer Hospital Guangzhou on newspaper so he consulted the branch office. After knowing more information, TJONG MEN TJONG went for treatment in Modern Cancer Hospital Guangzhou on July 8th 2014. TJONG MEN TJONG was diagnosed with lymphoma stage Ⅲ2. MDT in Modern Cancer Hospital Guangzhou diagnosed and analyzed his condition and they decided that TJONG MEN TJONG should take minimally invasive interventional therapy first. After two sessions of interventional therapy, the lymphomas obviously shrank and some of them were gone. After completing one course of interventional therapy, the lymphomas in his body were basically gone. TJONG MEN TJONG did not have many side effects of interventional therapy and he only felt nausea but it did not affect his appetite. In order to strengthen the immunity and reinforce the treatment efficacy, he also took natural therapy to prevent recurrence. 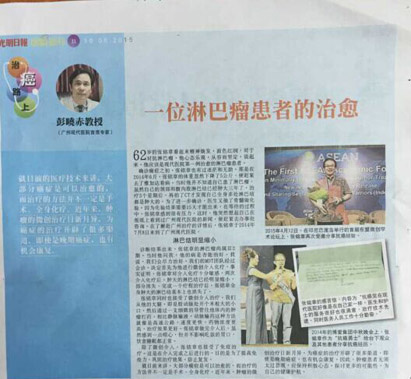 On the middle autumn festival party of Boai (China) Enterprise Group, TJONG MEN TJONG, as an anticancer warrior, shared his experience to the audience and other cancer patients. On April 12th 2015, ASEAN Academic Committee of Minimally Invasive Therapy of Tumor was held in Bali and TJONG MEN TJONG was invited to share his experience again. Nowadays, many cancers were treatable and it was not necessary to take traditional surgery or general chemotherapy. In recent years, cancer minimally invasive treatments were in accelerated development, which cut out a path to cancer treatments. Cancer in advanced stage was also treatable so cancer patients were no need to be pessimistic and should be positive and look for more cancer treatment choices for regaining health.